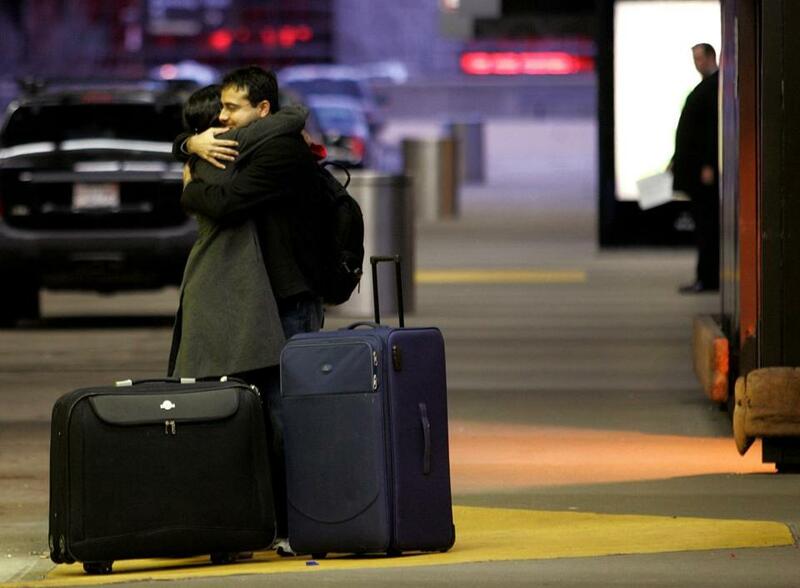 More than 20 percent of the drivers entering Logan Airport are dropping off a friend or family member. What if they all had to pay for it? The Massachusetts Port Authority has agreed to study imposing a fee on drivers who pick up or drop off passengers at Logan International Airport, part of a deal with environmentalists seeking to curb congestion and air pollution amid a surge in airline traffic. Each day, more than 20,000 cars enter Logan to leave friends or relatives at a terminal or meet their arriving flights, according to Massport. The Conservation Law Foundation, a Boston environmental group, says these trips could be reduced by charging people for driving to Logan. Massport, which runs the airport, agreed to study the fee as part of a broad truce with the environmental group. CLF, meanwhile, agreed not to oppose the agency’s $250 million plan to add 5,000 parking spaces at Logan if Massport examined other measures to reduce auto emissions at the airport. The review is expected to be completed by July 2019. Logan has added more than 15,000 annual flights since 2015. The new parking spaces, the agency argues, may actually result in fewer cars; pick-ups and drop-offs can involve up to four trips in and out of the airport, two for a departing flight and two for a returning arrival, while people driving and parking their own cars come in and out once. Such fees are not unusual elsewhere in the world, especially in the United Kingdom, where more than a dozen airports have implemented tolls over the last decade. It’s rare in the United States, though some transportation specialists predict such tolls are destined to make their way across the pond. At most airports, including Logan, Uber, Lyft, and taxi drivers already pay fees that are passed on to the customer, Mundy noted. “We’re only a half-step away from saying private automobiles, we’re going to start charging them as well,” he said. Those arguments are unlikely to be persuasive to passengers, said Charlie Leocha, founder of Travelers United. Massport chief executive Thomas Glynn cautioned that the fee study is but one aspect of a broader review the agency is conducting of ways to limit vehicle trips. Moreover, he suggested he isn’t sold on the idea. Glynn also said there is a “fairness” consideration, since many drivers heading south or west after leaving Logan already pay tolls for the harbor tunnels, which may seem like an airport fee to them. In 2013, about 28 percent of passengers got to Logan via a personal drop-off, according to a Massport survey — the most common route to the airport that year. That figure has since declined, to 21 percent, with the advent of Uber and Lyft at Logan. By comparison, 11 percent of passengers park at the airport. Adding more parking spaces, Massport reasons, could encourage more people to drive themselves to the airport. But Mares said additional parking isn’t enough to address the problem and that an entry fee may be necessary to discourage driving. Since Massport is also planning transit improvements as part of the agreement with CLF, including increased Silver Line service and airport shuttles from the suburbs, the threat of a driving fee may encourage passengers to instead take public transportation. Whether such a charge would have the intended effect is unclear. Mundy, the St. Louis professor, said casual fliers may not be deterred by a small fee and will factor it into the cost of travel. “Most people learn to absorb those $2 to $5 charges pretty easily,” he said. Dallas/Fort Worth International is the only US airport charging drivers to access its grounds. The fee has been in place since the airport opened in the 1970s, and it varies depending on how long a car is on the grounds. The road through the airport is also a common shortcut between two local highways, and those drivers are charged a premium toll to cut through. The fee is $4 for drivers on the airport ground for fewer than eight minutes, because that indicates they are simply cutting through, compared to $2 for eight to 30 minutes, indicating a pick-up or drop-off. But Dallas/Fort Worth spokesman David Magana said the fee isn’t so much to deter drivers as it is to fund maintenance. Despite the higher fee, more than 1.5 million drivers still used the road as a shortcut in 2016, according to airport data. State Representative William Straus, cochair of the Legislature’s Transportation Committee, said a Logan fee would likely run into stiff public resistance, especially if it’s to manage traffic. But Mares at the CLF thinks the public could accept a fee if the harbor tunnels and airport roads become so congested it is difficult to get to Logan. Already, nearly 108,000 vehicles enter Logan on an average day. That’s up nearly 9 percent from 2011 and approaching the all-time high of 110,690 in 2007. “If they’re at risk of missing a flight that costs them a lot more than ground transportation ever will, they might appreciate that these kinds of solutions will lift that stress,” Mares said.